Crinkled Crown: I'm from W-scon-sin! I am from W-scon-sin, born and raised and proud of it! I might really be opening a can of worms with this one, but oh well. A discussion came up at work recently about the way "we" talk. I speak with people all over the world and if they are from the United States they can usually tell were I am from. -Please, please, please don't call it Westconsin. There is no E in Wisconsin, thanks. -It's a bubbler not a water or drinking fountain (bubbler is like the Kleenex or Band-aid of drinking fountains, it's a brand name - check it out here). -We're not offended by being called a Cheesehead. We like curds and frozen custard, period. -Many people here are from German decent, with that being said, we like beer, bratwurst and sauerkraut, it's like they have their own food group. 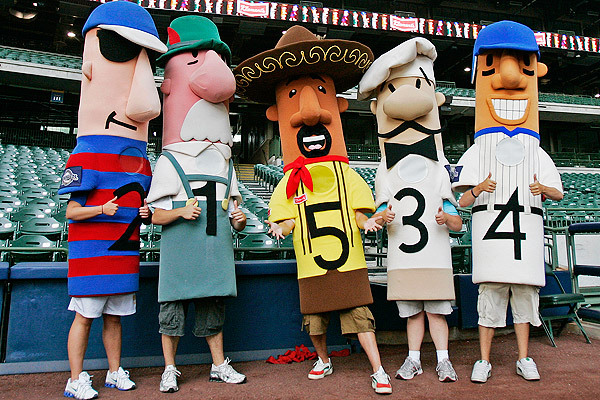 -Sausage races are a real thing and we take them seriously, lol. -And last but not least, the kicker. It's pop, not soda. This is a touchy one, I know. If you're from the Milwaukee area it's soda. Everywhere else in the state it's pop. We're proud of our heritage and state and we're not afraid to show it.